Dr Whitehead was elected to the post at the annual meeting of Upper Wharfedale Agricultural Society, long-time organisers of one of the biggest and best-known one-day agricultural shows in the country. 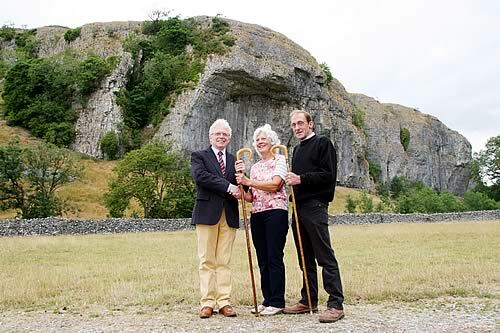 Pictured on the showfield at Kilnsey with the famous crag in the background, are, from left, new president Dr Peter Whitehead with his predecessor Dorothy Dean and Robert Lambert, who is in his last year as chairman. He takes over from Threshfield’s Dorothy Dean, who has completed her two-year term as president. “I have had the time of my life,” she said. Dr Whitehead, who lives in Skipton, already has a long-standing association with Kilnsey Show, having served as show doctor for almost 25 years. He retired three years ago after a 30-year career as a partner at Fisher Medical Centre in Skipton, where many farmers were patients, though continues to do locum work at both Catterick Garrison and in Northallerton. This year’s show also represents a milestone for local farmer Robert Lambert, who will be serving his last year as chairman, a position he has held since 2002. He was first elected to the show committee in 1969, taking over as vice-chairman in 1998. Mr Lambert will continue his long association with the show, having now been installed as president-elect.